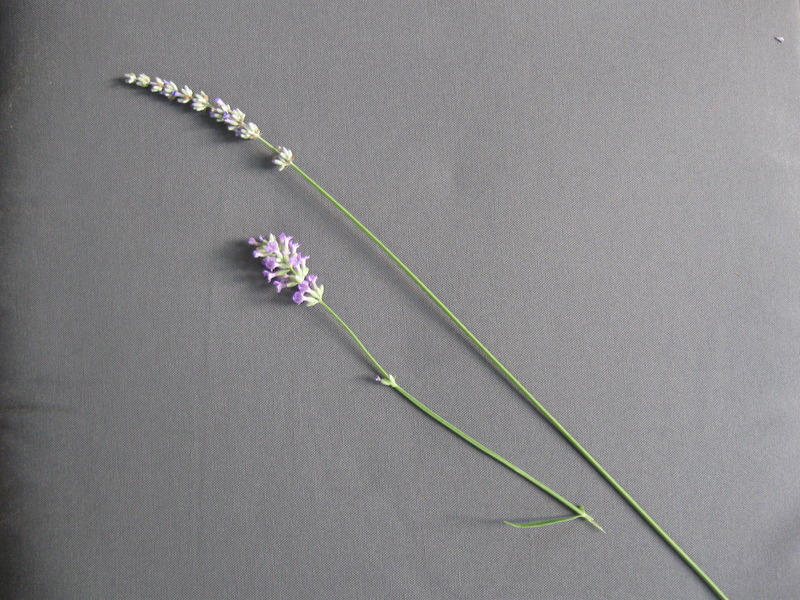 One of my favorite plants is lavender, Lavandula sp. I love the way the foliage is a shade of grey-green, the purple flower spikes, but most of all, its delightful fragrance. It’s easy to understand why it has been such a popular herb for cleaning as well as perfumes since medieval times. 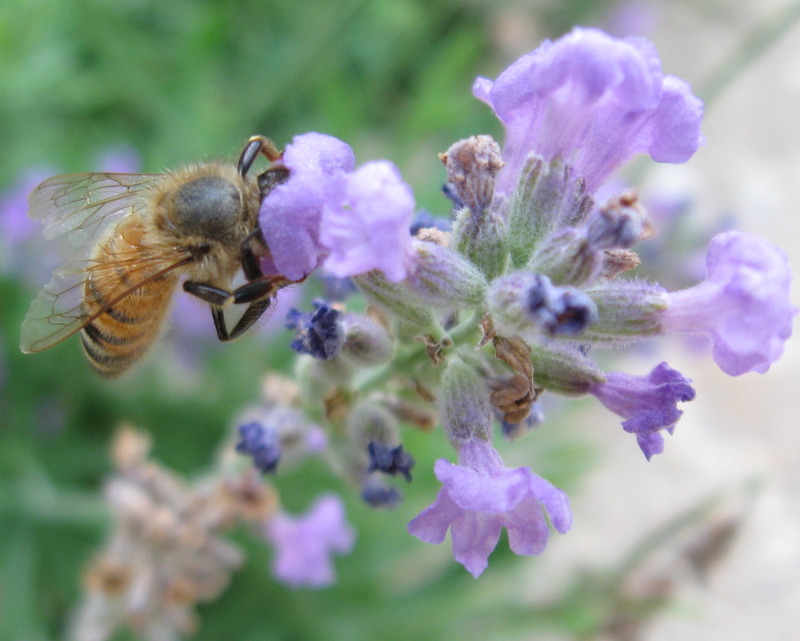 In recent years, chefs have been using lavender flowers to add a bit of its floral notes to culinary delights such as lemonade, cookies, as well as more savory dishes. I live in zone 5, which is good for growing both English lavender varieties, Lavandula angustifolia ‘Munstead’ and ‘Hidcote’. I have My Urban Farmscape bordered with Munstead. It’s nice to smell it as I brush up against it while weeding. I can harvest and dry the flowers to use for cooking or crafts. I sometimes put the dried flowers in fabric bags and place them in my drawers. 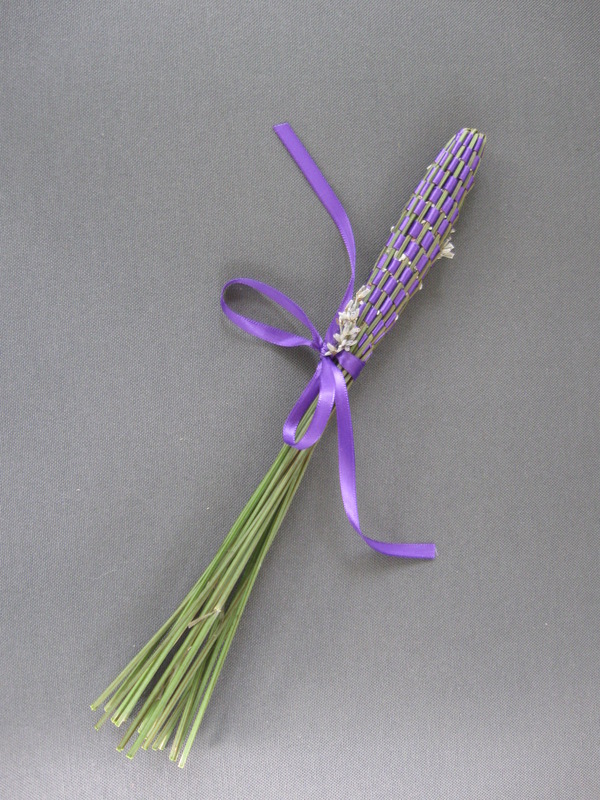 One thing that I like to do is to make lavender wands. These date back prior to the Victorian era. It is a simple way of preserving the flowers and stems and can be as decorative as I like. 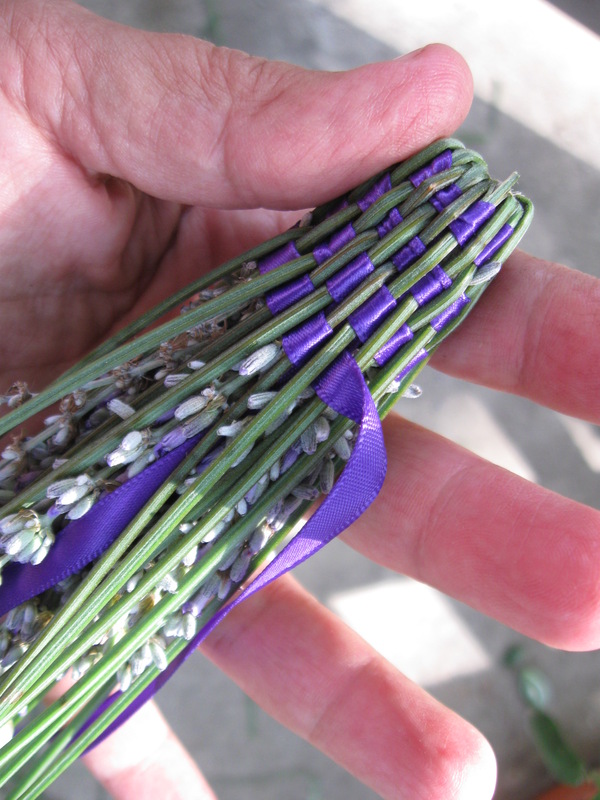 When they dry, the flowers are tucked inside the satin ribbon-stem weave, and with a quick roll between my hands, the most wonderful fragrance is released. 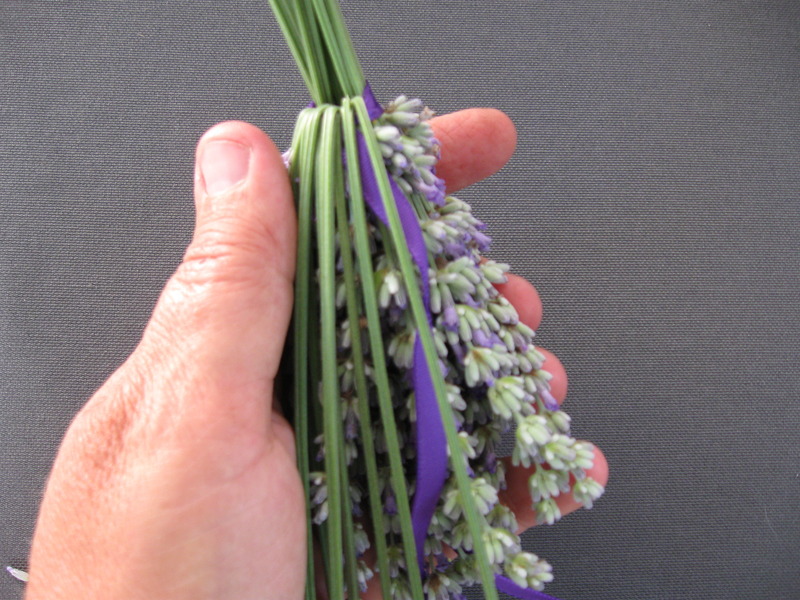 The best variety for making lavender wands is Lavandula x intermedia ‘Provence’ because it has such long stems and the oil content is so high. It grows well in zone 6 and up. So I wondered, what if I planted Provence in a garden tucked away in a little warmer microclimate, maybe I could grow this. I tried and have had been growing Provence for two years. Maybe luck. 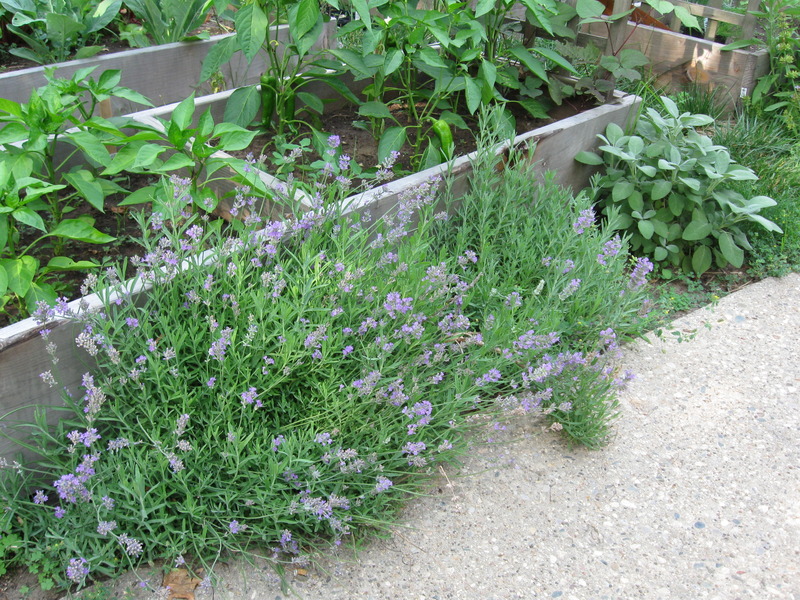 Harvest the lavender flowers at their peak, just as the lower petals start to open. Do this in the early afternoon on a sunny day which will allow the flowers to be dry from any overnight dew or moisture from earlier rains. Cut the stems as long as you can, and count out an odd number. I used 21 for this lavender wand. For Hidcote or Munstead, I would use a smaller number of stems or you will end up with a really fat wand, like a lollipop. Line up the flowers so that the bottoms of the flower stalk line up. Wrap the stems just below the flowers with a satin type craft ribbon that is ¼” wide. You can use any color. I like to be traditional and use purple. Tie the ribbon in a knot tightly. Leave a tail about 6” long, and don’t cut the rest of the ribbon from the spool just yet. This is the part you will weave in and out of the stems. Flip upside down and while holding the bunched flowers, start to fold the stems down over the flowers until they are all folded over them. Keep the ribbon tail inside with the flowers. Taking your ribbon still connected to the spool, start to weave over and under each stem, creating a basket weave. Once you get to the third row it will get easier. Once you have woven the ribbon to the end of the flowers, and the stems meet each other, tie the piece that was left as the tail and the piece that is still connected to the spool and tie into a knot then into a bow. Cut the ribbon from the spool and even up the ends of both pieces. Now you can do with them what you please. Tuck them away to add a pleasant smell in your drawers, give them as gifts, or wave them in the air to cast friendly magical spells over your garden. I just like to leave them out decoratively around my house and as I pass them by, I give them a roll between my hands and am quickly transported to that summer day when I sat on the porch while making them. 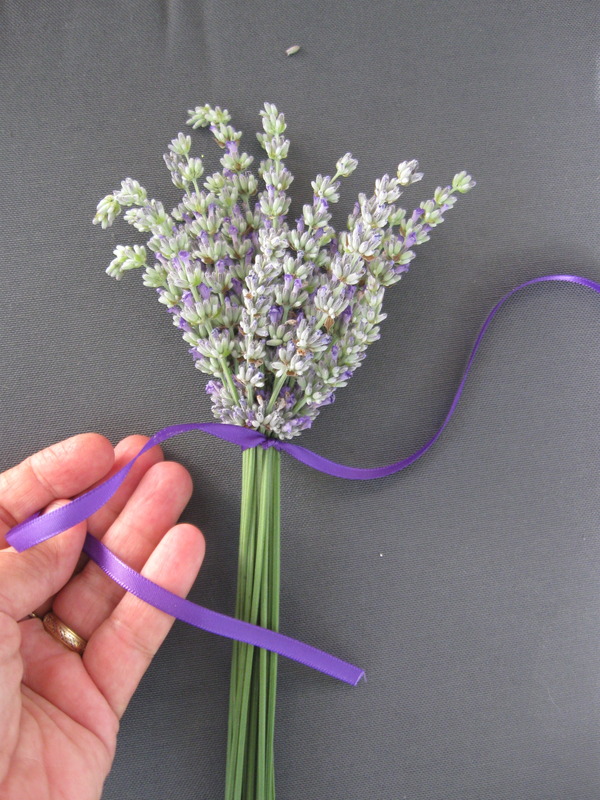 Just a few little tips I’ve used… I let the lavender “wilt” for a little while (in the shade) before I try to bend the stalks. I pick it in early in the morning and don’t try to bend the stems until mid-morning at the earliest. I find that once it has wilted a little bit I don’t get any cracking or splitting of the stems as I bend them. If I want a fat wand and don’t have enough long stems I pick some extra flowers and tie them off and cut off the stems short. This is then entirely encased by the rest of the “real wand”. For an extra-special treat (if you like this kind of thing) I sometimes wrap up a little parcel of whole cloves in a bit of cotton fabric and hide that in the middle too. Thank you Megan. These are great tips. I’ll try this next time. I forgot something I found out by trial and error. When using a single ribbon an odd number is needed for weaving (so if you like to weave under and over pairs of stalks choose an even number that, when halved, comes to an odd number, like 30, which gives 15 stem-pairs). Oh, finally, another nice experiment when you are weaving an odd number of stems (or stem-pairs) is to weave (over two, under one) instead of (over one, under one). You get a spiral pattern going on… So much fun! No doubt there are all sorts of other patterns you can make.